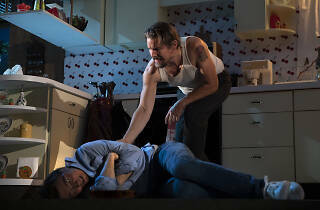 Ethan Hawke and Paul Dano play estranged brothers in the Broadway revival of Sam Shepard’s yin-yang drama True West, and the contrast between them couldn’t seem starker. As the older of the two, Lee, a loner and thief who has recently spent three months in the Mojave Desert, Hawke is raspy and slinky and implacable, with a scruffy beard and filthy clothes; as Austin, an Ivy-educated writer with a wife and kids and a screenplay in the works, Dano is pale and bespectacled and yielding. It’s the difference between beef jerky and a slice of white bread soaked in milk. (This dichotomy is mirrored in Mimi Lien’s sharply divided set: on one side, an orderly kitchen with appliances and cherry-print wallpaper; on the other, plants and wood and a view of the mountains.) Austin is looking after their mother’s suburban Southern California home while she is on a trip to Alaska, and his plans are upended by Lee, who imposes his will through the sheer power of shamelessness. But as the play presses forward, the tables are turned—or, literally, overturned—and the brothers try each other’s lives on for size. If the charismatic Hawke all but wipes the floor with Dano in the play’s first half, Dano gets his turn to act out in Act Two. These are showcase roles, and the actors play them with gusto. James Macdonald’s Roundabout Theatre Company production occasionally errs on the side of the obvious: Marylouise Burke brings her customary off-kilter comic panache to her cameo as the brothers’ late-returning mom, but Gary Wilmes smears an extra layer of grease on the already oleaginous role of a Hollywood producer, and a showy change of lighting undermines Austin’s big story about how his dissolute father lost two sets of teeth. 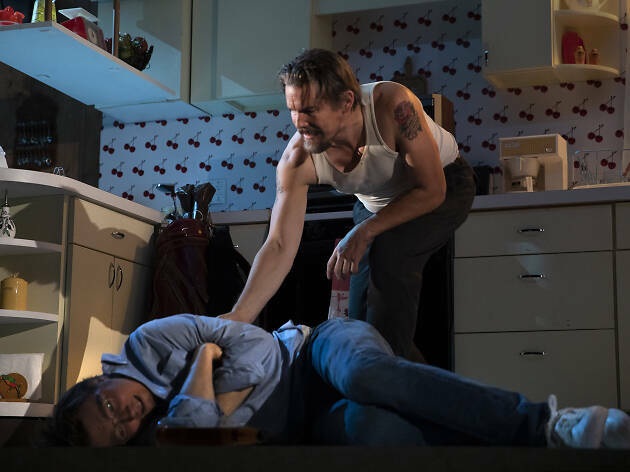 But if some aspects of True West seem too neatly schematic, Shepard’s dissection of authenticity and masculinity resounds in new ways in the current American political landscape. There is a lot of humor built into the conflict between the amoral, desperate, confidently doltish Lee and the exasperated, ineffectual Austin, but there is horror, too, as the play’s red and blue factions bleed into each other, yielding the purple of an unhealed bruise. American Airlines Theatre (Broadway). By Sam Shepard. Directed by James Macdonald. With Ethan Hawke, Paul Dano. Running time: 2hrs 10mins. One intermission.